As I’ve mentioned before, both of my parents graduated from high school in the early ’80s. Everyone gets attached to movies from their childhood and young adulthood, and my parents were no exception. I’ve been lucky enough for them to pass this fondness on to me, introducing me to everything from About Last Night… to Top Gun to all of the John Hughes greats, one of which I’ll be discussing today. I know of very few people who hate the films of John Hughes. I happen to love nearly all of them, even Flubber and the 101 Dalmatians remake. Sixteen Candles has always been near the top of the pack for me, though I’ve never attempted to rank his films. We all know that stars Molly Ringwald and Anthony Michael Hall continue to work in film and television, but what ever became of that hunk Jake Ryan? Jake Ryan is your typical high school dreamboat, and has become the object of affection for many an ’80s movie aficionado. Let’s not pretend we weren’t all hoping that the coolest person in school would show up in a hot car and mack on us on our birthdays when we were Samantha Baker’s age — and since Jake Ryan did just that, he won over the hearts of a lot of people. And he’s winning over more people all the time, as parents like mine introduce their kids to the film, and those kids introduce the film to their friends, etc. 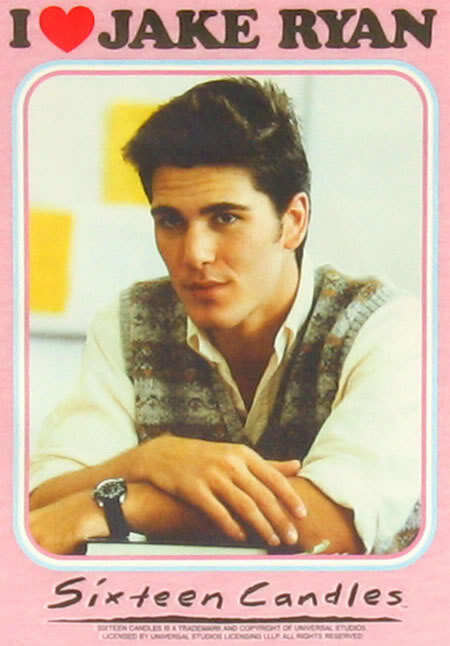 Jake Ryan was portrayed by Pennsylvania-born, Jersey-bred Michael Schoeffling. It was his first credited role, having otherwise appeared only as “Amputee Soldier” in 1984’s Racing with the Moon, which was released a little over a month before Sixteen Candles. Before his acting career began, Schoeffling worked as a fashion model. He had been an accomplished wrestler during high school and college but was unsure what he wanted to do as a career. Modeling allowed him to make money, travel the world and gain industry connections, which eventually led him to a budding film career. By all accounts, Schoeffling has gone on to live a content, normal life since retiring from Hollywood. He moved back to Pennsylvania with his wife Valerie (who he met during his time as a model — she was signed with the same agency), had a couple of kids and started a carpentry/hand-made furniture business (according to complex.com). He is now 53 years old. Wonder if he is still stupid hot? I couldn’t find any recent pictures, unfortunately!